Ruth Rendell, one of Britain's most popular and prolific crime novelists, also writes as Barbara Vine - though this is no secret. Writing under this pseudonym she has created gripping psychological thrillers. These are not so much who-did-it as how-they-did-it or why-they-did-it. The House of Stairs is an excellent example of this. It opens with a chance meeting between the narrator and Bell, a woman she hasn't seen in over twenty years - Bell has been in prison for murder. The story slips back and forth in time between the 1980's, as the women begin to reforge their relationship and the 1960's, where the events that lead to Bell killing unfold. It is set in and around London's Notting Hill (Before Hugh Grant and Julia Roberts stripped all the cosmopolitanism from its image), painting such a vivid picture of it in the 1960's that you can almost taste the counter-culture and see the people dropping out. The title comes from the Notting Hill house, owned by the flamboyant and eccentric widow Cosette, around which the 1960's section revolves. A tall, narrow house where it seems every room has someone different in it. The house appears as just as strong a character as any of the people who pass through it. The suspense does not come from wondering who the killer is, we are told almost from the beginning that it is Bell, but from the question, who is she going to kill? This also gives the novel a sense of doom as you wait for the evitable death, but not knowing when it is coming or who it will be. The suspense building as the twists and turns of the complicated relationships between the characters unfolds. The characters, with all their faults, failings and needs, are all too human. They are not mere devices to keep the plot flowing, it is the reverse; the plot comes from them, their humanness and shortcomings driving the plot forward. The main Vine/Rendell take on human relationships is present here; all of them are as equally screwed up. From the friendship between the two central women that turns into a secret lesbian affair, through the two siblings who appear strangely too close to the older woman and younger man who may or may not have found love together. Dark, sinister, repressed, doom laden but also page turningly good. 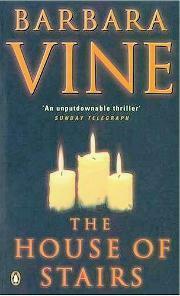 The House of Stairs is one of the best Barbara Vine/Ruth Rendell novels. But, like the best of her work, it is not only a thriller; it is a novel in itself. It paints a picture of 1960's Notting Hill that feels all too real - especially to someone too young to remember it. At the heart of it is a repressed and secret lesbian affair that drives along so many of the events but is also one of the most important relationships in at least one of the women's lives. (Some may say her view of gay and lesbian relationships is homophobic but my feeling is that she treats all relationships the same, she has a poor view of all of them). For me I wanted this novel never to end, so involved was I with the characters and their spiralling journey downwards, but there was a desire to know what was going to happen next pushing me onwards. A recommendation as long as you are not looking for a "happy" read.